Two North Carolina A&T players have been on the Walter Payton Award Watch List entering the season the last two years. Last year it was Tarik Cohen and this year, offensive tackle Brandon Parker was spotlighted. Well, you can add a third name to that list. A&T quarterback Lamar Raynard was one of six players named as a midseason addition to the list on Wednesday. Raynard, a High Point, NC native, is having a banner year for the unbeaten Aggies. The second-year starter has thrown for 1,848 yards and 20 touchdowns while tossing just three interceptions all season. He’s also completed a sizzling 68.5 percent of his passes. Prior to the season, A&T head coach Rod Broadway told us that Raynard appeared to be ready for a breakthrough season. Broadway’s prediction has certainly rung true through the first seven games of the season. Raynard, along with a receiving corps led by sophomore receiver Elijah Bell (37 catches, 15.5 yards per catch and nine touchdowns) have turned A&T into a dynamic offense capable of being prolific in the air as on the ground. The Walter Payton Award, named after the former Jackson State legend, is given annually to the top player in FCS football. No HBCU player has won the award since Steve McNair in 1994. Grambling’s DeVante Kincade is also up for the award along with the A&T teammates. The MEAC is generally known for being a defensive league and most of its star offensive players in recent years have been running backs like Cohen or South Carolina State’s Will Ford. 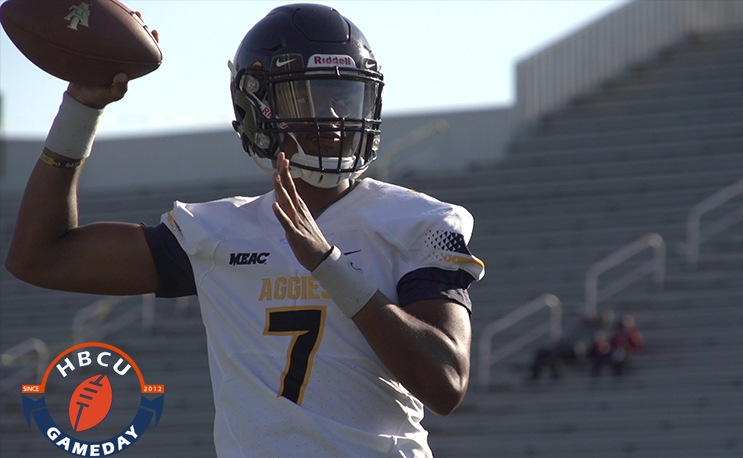 If A&T remains nationally ranked and Raynard continues his success, it would be a big breakthrough for not only the quarterback and his school, but the conference as a whole.